ArcGIS Online is widely used in higher education (and K-12) across the United States and throughout the world. Every week, we are pleased to greet several new high schools, colleges, and universities, welcoming them to the Admin Tools for ArcGIS Online user family. It is awesome to know we are assisting GIS administrators and helping support their students and future GIS professionals. 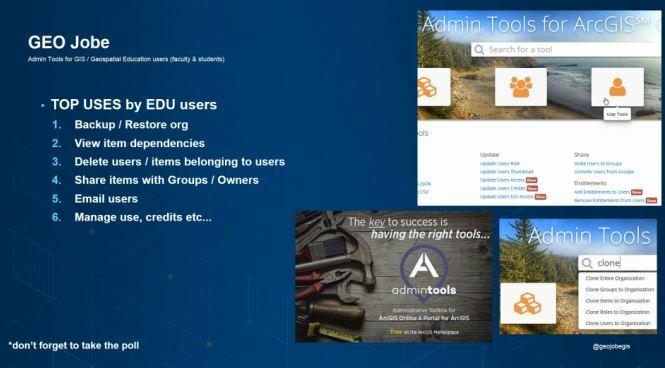 Why is Admin Tools Ideal for the EDU Community? It’s no coincidence that, when we search through our extensive user-base, we find many users from the EDU community. Admin Tools has many useful capabilities; in particular, these tools make it very straightforward to manage whole programs of students (or other large group of users in your ArcGIS Online organization) in just a few actions. For example, David MacLean (@DaveAtCOGS), GIS Faculty at the Centre for Geographic Sciences (COGS) in Canada– part of the Nova Scotia Community College, has been vocal about how Admin Tools helps him to manage his users. COGS is Canada’s largest geomatics-focused learning institution – uses several tools as part of their routine account clean-out. In just a few, simple steps, administrators can manage all the students and content in their program. This can make the start of a new semester much more streamlined and stress-free. 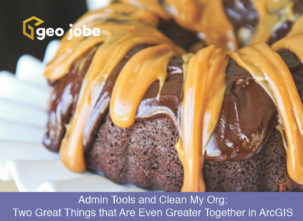 For educators wanting more information about the tools, GEO Jobe, along with the Esri Education group, presented a webinar on managing your ArcGIS org with Admin Tools in late 2016. The focus of the educational session was to introduce users from the GIS Education community to Admin Tools, a powerful suite of apps and tools that help ArcGIS Administrators be more efficient. Our EDU Admin Tools users are avid users. Some of the top uses by the GIS EDU community include: backup and restore content, viewing item dependencies, delete users, email users, and manage user credits. Are you part of a GIS college program or GIS / Geography faculty and using Admin Tools? If so, we’d love to hear about how the tools have assisted in making your program run more smoothly. GIS students – want to be a hero and score some big points with your GIS teacher? Introduce them to Admin Tools for ArcGIS Online. They’ll be sure to thank you, and we suspect your grade might get a bit of a boost also! Oh, and don’t forget, when you graduate from your college, you can use Admin Tools to help migrate all your ArcGIS Online content to a free, developer account. 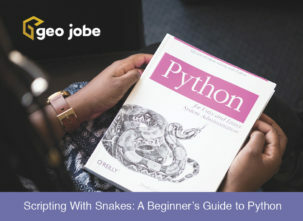 If you need some help with this, feel free to ping us on Twitter @geojobegis or click the Live Chat icon (lower right) in Admin Tools itself. Looking for more admin Tools Tips? Register for our monthly newsletter for more GIS, geotech, mapping, UAV, ArcGIS, and technology tips and tricks!